The time has come to take a good look at yourselves, dear ones. Do not be shy, and take into account all that you see. Who are you really? And how have you evolved over these last few months, if not weeks? Do you still feel the same, or do you feel as if everything has been turned upside down? Is the image clear, or is it still somewhat blurred? We see you very clearly dear ones, and we see the splendor of who you truly are, but we also see a lot of unchartered possibilities still lying dormant. Let us also remind you of your reason for being here in the first place. Originally, mankind was put onto Earth to help the whole of Creation learn a lesson that could not be given under equal circumstances anywhere else. For you have been put into a physical form with many limitations, and you have been cut off from your own inherent greatness in a way that would force you to evolve by your own provess alone. And that was an interesting experience for us all. Not just for all those lucky enough to partake directly by being allowed aboard a human vessel and get to live it all by virtue of being a human amongst other humans on this little planet. But the lessons you have learned, have been for us all, and that has been the intention all along. But, as you know, some other beings intervened, and changed the rules in the classroom so drastically, you were forced to live under a regime that actually hampered your education instead of encouarging it. As you know, these false rules have now been set aside, and you have once again been allowed the freedom to start to blossom freely, like you were meant to from the very beginning. And many of you have taken upon you the role of being the forerunners in this. For not only have you started to throw off these old shackles of fear and started to grow into the real you, but you have also started to open your heart to the fact that you are an integrated part of the divine cosmos. You are not merely a human being, you are also a spirit that is connected to All there is, and so, you are so much more than what you see when you look at yourself in the mirror. That is a fact, and we know you have started to realize it, but it is mayhaps not a fact you have truly taken to heart yet. As we told you in an earlier missive, there are still some blockages stopping the flow of information in the form of light into your heart, and those are the blockages that you have been told to look into now. For they must go, otherwise you will not be able to do what you came here to do. For you came here to bring heaven to Earth in the form of channeling in the divine light that will bring with it the knowledge that has been hidden from mankind for eons. But unless you remove those blockages you still carry within, that light cannot access your channel fully. And so they must go. But what are those blockages, dear ones? Well, to put it to you in the best way we can, we want you to see that they are nothing more than battle scars, remnants from all of the human dramas you have been partaking in while you attended the school of fear. These scars can be few, they can be many, they can be slight, or they can run very, very deep. But they are all nothing more than scar tissue, they are actually dead and devoid of any importance at this stage, but as in your phsyical body, this dead tissue is standing in the way for new growth. And so that is why we have told you to let the light come in, for the light will effectively remove these scars, and it will do so painlessly. But for many, the biggest problem is that they fear these scars, they fear the painful memories and the emotions that made them originally, and so they lose their courage and just pretend that these scars are not even there, or they use all of their energy trying to gather the courage to crack them open. But as we told you earlier, the actual removal of this scar tissue is so much easier than the accruing of them, and infinitely more painless than what many of you think. For you still fall back into human drama when you look at those scars. For the scars in themselves can trigger so much more drama, and so, it turns into a never ending cycle of drama and more drama, all of which is compeletely unnecessary. Remember we told you earlier to not just leave the stage, but the whole theater of human drama altogether? Well, never have those words been more important. For if you continue to fuel these old scars with new drama, you will only block the light from your channel more and more, and soon, even the strongest of light will have a hard time penetrating it at all. So step away from it all, and look upon it for what it truly is, just old remnants of old drama, wounds from the old school of fear that are ready to be healed and removed in one go. That is, if you allow them to be. But if you insist on scraping into them, either by forcing yourself to look away from them, or by continuing to remember the reason for their existence, you will make this whole opening up of your own divine channel nearly impossible. So again we say, only by stepping away from the drama, and by letting the light come in, will these old wounds disappear, and the blockages they make will also come undone, and the light will flow fully into the very core of your being. And from there, it will be allowed to flow out into your world, and then, miracles will start to happen. And when we talk of the light, we talk of the divine light coming in from heavens above. You are all connected to this light, but as yet, the force of it has not been set to full, and it cannot be that either, not before we are well and truly sure that your channel is clear and ready to take it in. And so this is what we want you do to. You must allow yourself to truly receive what is being given from above. And so, this upcoming Sunday, during the next Gathering, we will help you all we can to attain that full opening. For then, you will be asked to surrender yourself to receiving this healing light that comes from above. You have all been hooked up to the divine golden grid already, and now, the time has come to start to open up for the full potential it carries. But remember, in order to achieve just that, you must also allow yourself to let go of the human drama that helps to lock you in in so many ways. For then, and only then, will you become that open channel for divine light that will change not only you, but your whole world. Forever. As you have mayhaps noticed, the inner voices can be more than a little insistent at times now, and what they demand of you, can be more than a little daunting to handle. You have set yourselves free in so many ways, but these small hindrances still standing in your way will start to make a lot of noise. And they will do so for a very good reason, as it is indeed imperative that you all clear your channel as it were in order to make yourselves fully able to access the information you so dearly seek. In other words, nothing is allowed to stand between you and Source, and now, the only things doing so are those innermost kept secrets that only serve to fog your vision from clearing up completely. For many, it will be something extremely painful, for these are the things you have kept hidden away in the deepest and darkest recesses of your cupboards. They might be remnants of this life or earlier lives, things you may not even have a clear memory of, but lies there as a festering sore that needs to be cleaned once and for all. The good news is that these wounds themselves need nothing more than to be exposed to the light in order to heal, so the process in itself is a much more simple one than you perhaps fear. For the fear of the wound is much more painful than the actual healing of it, and so we do advice you all to find a way to let these things surface. It may not come about by itself, and so, asking for assistance from your peers, or from others that can be of help is essential. Remember, you do not stand alone this, you are surrounded by love on all sides, but unless you let that love penetrate you to the very depth of your being, it cannot help you shine as strong as you need. So let the light in all the way, and please seek help to do so. For you are so good at shying away from what has caused you pain earlier, but now, the only way to get through it is to face it head on. And remember, it will release at the very first sight of the light, and it will bring you tremendous release in every way you can think of. But it does not happen all by itself, for you have to make a conscious decision to let it go. So again we urge you to dare to open that final door, and reach out and hold someone’s hand if you need help to be better able to face this. For you do not need to go there alone, that is not required of any of you. But what is required, is that you do go there and bring the light with you, and that very action will make every last drop of inflammation drain away immediately. It will be a full and complete healing of all that has been festering away, but it will only happen if you allow yourself to let it happen. You are the bravest of the brave dear ones, but you do not have to take everything on single handedly, and certainly not this. For you do not have to prove yourselves to anyone, and the sooner you let yourself acknowledge this, the better. You are strong, but you are far far stronger if you let yourselves be held by others. So let them assist you on this, your last and final step into greatness. The days have become more and more intense in so many ways, as you see the light shining through not only yourself, but also those around you. In addition, the nighttime will also bring much information. And although much of this information is in many ways still hidden from you, it is already having quite a profound effect on you all. Let us explain. As always, whenever we refer to information, it is not necessarily in the manner that you refer to information. In other words, it may not be such that is given in words or clear pictures and that leaves you feeling wiser and more ”on” to what is going on. Not because you are in any way lacking of abilities to comprehend what all of this information is about, but because this is a form of communication that talks to all levels of your being. And as such, at least for now, you are not able to consciously connect with all of these levels of communication. And so, you will in many ways feel as if you are still left out in the dark as it were, and that you have no, or a only a small fraction, of clarity into what is truly being exchanged here. Again, that is only because you have not been able to access these deep seated channels of information that is fairly teeming with activity, and now, that activity has been amped up even further. So many of you may have noticed this already, either in the form of thoughts or ideas that seemingly surfaces at the most unexpected times and in the most unexpected of circumstances, or by the fact that your brain seems almost incapable of focusing on any thing at any given moment. And the explanation for both of these ocurrences are one and the same. For now, the amount of information that is pouring into each and every one of you has increased to a veritable avalanche, and so, some of it will indeed be made public as it were by your increased ability to pick up on these signals that are being beamed into you. While on the other hand, the easiest of tasks seem impossible to even contemplate because you feel as if deeply fatigued in the very center of your every day being. In other words, mundane tasks may seem to be insurmountable at times, while you during this same period of mental fog may get sudden and profound insights that will make you literally sit up in your chair, or perhaps we should say bed, for many of these instances occur during the nighttime. And we are also aware that another not so fortunate outcome for many of you will also be the seeming inability to get a good night’s sleep. You will toss and turn, but no matter how hard you try, it is as if the lights within your head simply refuse to dim down. This inability to detach and turn off everything that is going on within may leave you feel more than a little bit exhausted, because there seems to be an almost ceaseless activity going on in your head. It is as if you can literally feel the humming and buzzing, like a beehive within your brain. And indeed, that can in many ways be a perfect picture of it all, because all of your neural passages have been turned into a veritable beehive of activity, with signals going to and from new passages and connections being put together at the speed of light. And this in turn, is accompanied by some other, and at times rather confusing signals too, in the form of sound or even vibrations that will make it even harder to fall asleep. And so, you are all super charged in that part of your being that is the control center, and so, much of the rest of the body will feel the oucome in all sorts of ways as this frenzy of activity starts to interfere with other, more mundane processes that is part of your daily rutines. But we do hasten to add that although irksome, they are in no way harmful, merely annoying. And the upside is so beneficial, we think you will all have it in you to find a way to accept these small and large quirks and quakes that accompany all of these injections of information. For what you gain from all of this frenzy of activity far, far outweighs any irritations it will leave in its wake. And so we say just stay the course, and know that what you are taking part in now, is such a monumental shift for all of humanity, and it is all happening within each and every one of you. It cannot be likened to anything that has happend before, as this upgrading and information is on a level that no physical being has ever been subjected to before. That in itself can be enough to set off the alarm bells in many a timid soul, but again we do assure you all that the levels of supervision and careful adjustments are so presise, there is no harm that will befall any of you. For you are here to do a task that will change the outcome for this whole planet. You are each and every one of you a vital part of this monumental operation, and so we would not risk this by doing something that may set you back even a fraction. So again we say keep breathing and stay centered, and even if your mind and indeed your physical body may seem to fluctuate wildly at times so that you may feel on top of the world for one moment and then down in the basement the next, you are being lifted higher and higher every second of the day. And know also that even if you become more than frustrated by the seeming lack of access to any or all of the information that you are actually being a party to even as we speak, it will come to you in every glorious detail, when the time is right. And yes, we do know that this will elicit more than one frustrated groan, for we do know your eagernss to literally plunge into the thick of it. But again, timing is everything here, and this information is literally useless unless it is being used in the right context and within a timeframe that will ensure its feasability. So know that all is well, and even if you feel more like horses still caged up behind the starting gates at times, know that this race to the finishing line is already taking place, yes, at the speed of light. We will leave it at that for the moment and invite you all to try to tune into some of that information stream you already have within. For not all of it is closed to view, and the tidbits you can come across there will certainly help to assuage your voracious appetite, at least for a little while. The time of change has been a long time coming for you all, but now, it is as if you can feel the breath of fresh air coming at you, even if your physical and mental bodies may feel more than worse for the wear at the moment. Much has indeed changed already, but there are still some pockets of resistance within as you all go through this last uphill towards that final goal you have been seeking for many a lifetime. Remember, you started your quest for this freedom a long, long time ago. It has been a journey that spans more than one lifetime, and even if you have not been aware of it for most of these lifetimes, you have had a yearning for that day almost forever. You see, the seed that has been lying dormant for so many generations has not been completely silent, and its small voice has been perceived is all sorts of ways. Some of the actions taken on by mankind have always been governed by that small voice, whether they may be looked upon as ”good” or ”bad”, because that small voice has in many ways been like a tiny little grain of sand itching away inside. There has always been ”something” there, indefinable, that has pushed mankind ever onwards. Of course, the road chosen for this ”onwards” has not brought only joy and happiness. In fact, you have been effectively waylaid by other forces so that your quest for finding the place that will silence this urge within has brought you all out on a limb. But now, mankind has finally found a way to interpret the calling from this voice in the way that it was originally meant to be. And that original intent was this, and only this; as a beacon of light that would lead you all to regain your former glory in all intents and purposes. For some, that small inner voice will still act as a mere irritant, something that leaves them no option but to lash out in frustration and despair. For they have long since given up the urge to really, really listen to this voice and heed its call. Instead, they look upon it as nothing more than an irritating pest, buzzing ceaselessly around them. And they swat and they duck and they try all sorts of things to eradicate this voice, but to no avail. But then one day, someone like you comes along. Someone who has taken the time to sit down in silence and really, really listen to what this inner voice has been trying to tell you all along. And you have seen the truth in its message for change. For it is not a grain of sand gnawing away at your soul any more. It is a shimmering, iridescent pearl of such beauty it takes your breath away when you finally see it emerge form the deep layers within. For you have all seen the beauty of this pearl, this inner seed of knowledge that has been lying there dormant, waiting for the light to start to sprout and grow. And now, that seed, that pearl within, has not only started to sprout, it has started to grow so much it is already enveloping much of you in its radiant and lush foilage of bliss and joy. True, you still feel the ravaging storms hit you hard at times, but when they subside, you can savour the bliss from within your new abode of light and love that is stretching and growing and covering more and more. Not only of you, but your surroundings as well. And when one of you, who has allowed this inner seed to emerge and to flourish, comes across one of those still carrying that seed as a dormant little grain within, the light and the exuberant energy you exude will also call to that inner, hidden seed. And when your vibration comes into contact with this small, still dormant seed, it literally wakes it up and gives it the signal that now, the conditions for growth are so much more favourable than before. And then magic can start to happen. For there are those becoming even more irritable as that inner seed starts to make its voice heard more and more because of these signals to start to grow. But there are so many others finally starting to heed that call, and to listen to it in a way that will make them too allow that inner sprouting to take place. And so you will see these inner gardens starting to emerge all around you. Some of them are vibrant and lush from the very get go, while others are more prone to staying too close to the shadows and need some extra coaching and light to attain a more vigorous growth. So you are in a way all gardeners in this, not only by maintaining your own healthy and vigorous growth, but also by helping others to nurture their inner gardens. For every healthy garden there is, many others will be inspired and indeed spurred on by merely watching your growth. For, as we have told you earlier, you are no longer invisible, for you carry with you the signals of this newfound vitality wherever you go. Granted, because of these growth spurts you will feel less than vital yourselves at times, but that is only to be expected. And remember, this seeming lack of vitality and this torpor you experience are not because of a lack of energy, far from it. It is merely a signal of a super boost having taken place, and so, your physical body needs a little down time to accomodate it all. But you are all growing dear ones, and you are turning into these mangificent, lush havens that will help to nurture mankind and indeed this whole planet forever. So remember to rest in the shade of your own beauty, and try not to feel too downcast on those days when you feel yourself flagging. For you have already passed that stage of growth where you are at your most vulnerable, so there is no stopping you now. We salute you all on this mangnificent day, as we see you standing shimmering in the light, getting ready to step forth with all the magic you carry within. For a long time now, you have been staring at the horizon, looking for an opening in this stormfront of mixed emotions. One day, you will be up, while the next day, you will feel as if plunging down an elevator shaft so long, the mere speed of it will leave you breathless. And so it goes, up and down, until you are left feeling as if reeling from it all, unable to find a stable place to stand on. Well, this wild ride is not quite over yet, but we are here to tell you that in a few days, you will feel it all ease off, and soon, these wild fluctuations will start to slow down as you slowly emerge from this wild water ride and out into smoother waters. We are aware that for many of you, the mere sight of the word soon will raise a few hackles, because you have gotten the idea that soon just means ”some time far, far into the future”. Well, this time soon means just that, as after this week of heightened activity, you will all be able to feel how the energetic waves lessen. But just like after a storm, you will be holding your breath, waiting for the next wave to crash into you, so it may take a few days for you to notice it when this subsiding finally arrives. The physical body is rather slow on the uptake, so it will feel a bit like it is in fight or flight mode even after this storm subsides, so again we can perhaps say that the word soon will also this time be perceived in a rather individual way by all. Still, we just want you all to know that these very intense upheavals are to be a thing of the past in the not too distant future. So hang in there as they say, and you will feel yourselves floating in much smoother waters before long. The tide has turned for so many of you, as you have one by one relinquished those shackles holding you firmly fastened to the old you. And, as you can see for yourself, as soon as you let go of this viselike grip it had on you, it is as if your feet barely touches the ground. You become filled with so much light, it is as if you are almost levitating from the sheer lightness of BEing. Yes, we are well aware that for some, nothing could seem further off than this image of floating through any obstacle that seemingly appears right in front of you. Instead, it will feel as if you are being rammed head first again and again into a brick wall. So what we say now, is only to encourage you to keep going, for sometime very soon, you will also feel as if this brick wall simply crumbles into dust and vanishes, and you too will be able to breathe freely once again. And how do you attain that freedom, we hear you ask. Well, again the answer must be only you will know. For it is you and only you who can be able to discern the chain that links you to the old and dense past you have been dragged through for so long. The light is there to help you see better, but the light cannot tell you what to do, or even, what to see. For that is you and you alone who are able to understand the signals and the not so discrete hints coming your way that will point you in the right direction. But it is your choice to open up to what you see, and to act accordingly. So in this, you stand alone, but not unsupported. For you have a whole host at your beck and call to abet and assist you in this. Some of this is of pure energetic nature, and as we have talked about earlier, never has the power of the light been more helpful in helping you to break through this last and final barrier. But you have also by now acquired a whole host of more earthly bound souls, like all of these fellow men and women you have connected with through these messages. You all walk on individual paths, but by now, you have also learned the lesson in connecting your light in such a way it helps each and every one of you to shine stronger. We know it is not news to any of you, but it bears repeating once again: do not make the mistake of hiding away like a wounded animal when you feel the lightstorm raging within, but reach out and ask for assistance from those near and dear. For you all need to connect, that is the only way to get through this. But again, choose your way of connecting, for that can also come in all shapes and forms. Personal contact, sharing words, touch, or just energy, you will all find a way to lean on someone that will help you see things in a better light, and indeed, make that final wall so much more penetrable. For going alone will only make that wall seem almost bulletproof, and your instinct to hide away in shame or humbleness will only make it all that much harder to break through. So open yourself completely, and you will feel how not only the light from above, but also from every soul standing beside you, will flow through you and strengthen you. But that will only happen if you come out of hiding and stand out in the open, letting those that can see you reach out and add their light to yours. That way, you also help each other. For it is indeed like in the Pond. The more you share of your own individual energy, the more you will be replenished from Source. So give what you can, but it is even more important to receive all you can, for that way, you keep the circulation of energy growing and magnifying in the best way there is. As you have mayhaps noticed, these energetic intermissions seems to be popping up again, as in giving you all a little time to breathe and survey the surroundings before the call to go within and focus once again arrives in the form of some friendly fire, if we may use such a word. For these blasts of energetic balancing tools will feel almost like a fire within for many of you, as they will churn and burn away at anything that needs your attention. Yes, this is not easy going for anyone, but it is indeed a very, very effective way of ensuring your total liberation from anything that could be standing in your way. For you are indeed approaching the moment when you will feel lighter than the light, when the last capstone falls into place, and you stand there complete, ready to take on the task of helping the rest of humanity follow in your wake. We hear a sigh of exhaustion from many of you at the prospect of being inundated with so much work once your own process has been completed, but trust us when we say that the work we refer to here, is of a very different caliber than the one you are in the middle of completing yourselves. For remember this time, it will not be about personal toil and travail, it will be the in the role of wayshowers and companions to those setting out on the same path as you. And also, those following in your wake will have a much easier time of it, for they will be able to follow the trails you have all blazed trough the densest of jungles and over the highest passes. And so, where you were forced to go slow and literally fight your way ahead, they will be able to pick up speed and race after that much sought out goal in a much shorter time. It may sound unfair that others will get the express lane towards enlightenment, but again, you have taken upon yourselves the task of clearing the way, and you have done so in a formidable way. For remember, you are indeed the bravest of the brave, the tenacious ones, the ones that were chosen because no one could be more fitting than you to fulfill this monumental task. And you have all shown yourselves more than worthy of this assignment. So again we say, give yourselves ample time to celebrate your journey. You may have a few steps left, but these steps are nothing compared to the long and arduous journey you have already completed. For some, the rewards are already starting to pour in in the form of bountiful confirmations in every field. For others, they are that close to breaking through the last and final barrier holding them back from hearing the cheers as they cross the ”finishing line”, so there is indeed much to celebrate these days. But in this kind of labour, it is difficult to define your achivements as ”finished”, for as soon as you cross that line of completion, the next phase takes over. But this phase is all about blossoming and growing outwards, embracing your powers and discovering even more of them. In other words, the final stage of going upwards and outwards for as long as you want. For then it is up to each and every one of you to decide just how far you want to take your limits. You are limitless, but you will not access more than you choose to yourself, so in that, it is indeed once again your decision, and your decision only that rules the day. Let us leave it at that, and give you all a chance to digest these words, and to see your own journey in perspective. 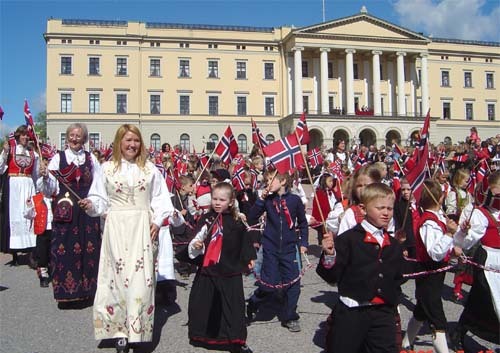 Today, May 17, is Norway’s National Day, when we celebrate the fact that our Constitution was signed, ending 400 years of Danish rule. All over my country, the streets are filled with thousands of children in flag parades. It is a wonderful way to celebrate our freedom and independence, filled with laughter and joy. “The degree of separation is indeed being marginalised. We will soon meet at the edge of the forest where the light from the pond is being refracted into myriads of little sparks igniting everything in their wake. These are auspicious times as you will soon know the true meaning of the word soon. As the mountains yet again shrugh off their pallour, so will you all stand before the rest of mankind in your true splendour. Nothing can ever again hide the magnificence and the true essence of the universe transfiguring you all in the face of the many. They too will have the choice of lessening their burden and enter into the realms of the multiverse, where they will yet again meet up with their true selves. So much more magnificent than they could ever imagine. The vision may be too much for many, but those of you who are firmly rooted in this belief, know that this is no monster, but truly the heavenly gates opening up for you all. We are always here beside you as you reside in the earthly realms. For many of you, this is the last time you will step gingerly upon these shores. You will from now on step boldly forth being who you truly are. And nothing more will be left to the imagination. The outcome of this is not yet clear, as the potential for change also holds the potential for several fortuitous outcomes. This is the prize you get for ”playing” this game; being creators of the new world and deciding which wrongs to right and the right way to do it. So you are truly blameless for all the misgivings and misfortunes which has befallen so many on this planet. Remember – the choice of self molestation so to speak has been the choice for generations. Thereby trodding these steps so deep it is difficult to see over the rutted tracks of forefathers toiling on this hard path for generation after generation. Now you have stepped out of these ruts, and you can see the horizon and know that the green grass is waving gently in the breeze, glittering in the warm sunlight. The ruts of toil are ready to soften again as no steps churn them deeper into the earth. Instead, the tears of joy will soften the clay and moisten it so the germs of the new seeds can take root and cover up these tracks of tears so that no one needs step into them ever again. The trap will no longer trap the unwary, and the harm they have done will linger only faintly on the landscape of tomorrow. Like a reminder of where you have been and beseeching the glory and the joy you now have cavorting on the green fields in your picnic with love. We are therefore not the only ones beholden to you, the forerunners. The generations to come will venerate you and hold you in their highest esteem, as those who broke the mold and made it possible for them to finally realise heaven here on Earth. As the waves from the initial splash into this lovely pond of light you have created have started to subside, many of you will feel yourself at a slightly different place, or rather, state than before. For as you so lovingly opened yourselves to this energetic grid that was created from your individual strands of light, you also let down the barriers that have been protecting your innermost sanctum for such a long time. And by doing that, you allowed the light to touch your very core, and for many, this will have far reaching consequences indeed. For know that for so many, you have been spending a lifetime, if not many more, behind hidden barriers you had build around your very soul. These barriers where there to protect you in so many ways, but over time, those barriers became a hindrance to your own liberation. You see, your ego had taken over these barriers, and as egos go, they are nothing if not eager in maintaining status quo. So in this process of enlightenment, you have chipped away so much that was standing in your way of attaining your freedom, and then, when you finally thought you were free, these bursts of lightwaves barreling through you all in the aftermath of this reconnection would literally crash into these, the last frontier as it were, of self-imposed protection. For some, it was a minor event, but for others, it was literally a shock to the system. So we venture to guess that this last week or so has been an eventful one for many. There will have been cries of joy, but also tears of despair. For nothing will be left untouched now that these old barriers have been dismantled once and for all. But again, it is also up to each and every one of you how to react to what you finally find exposed by this light. For it is there, and you cannot but see it. But you can choose to embrace this truth, or you can choose to walk away from it. No matter what you choose, the decision is yours, and yours alone to make, as it will always be. Just remember, no matter what you choose to do, never have you had so much light at your disposal to help you see through, and also walk through, these truths that lie before you. So choose well, and know that this light can seem painful in so many ways, but it is also a light of healing. And know that this time, it can heal the last of those scars you might still harbour inside. That is, if you allow it to do so. You have by now gotten used to the idea of reading words given to you through an intermediary such as the channel we are using. However, from now on, we also want to urge you all to try to communicate directly with us. And when we say ”us”, we refer of course to the collective known as The constant companions. This is of course just to make it easier for you to open up to all of this, for if we had asked any of you to just pick out a name of an entity you wanted to communicate with, it might have left you stymied in so many ways. So, that is also the reason we have chosen to appear in the form of a faceless and nameless collective. You see, you have all the ability to connect with ”the other side” as many like to refer to us as, but until now, it is one that has been reserved for a small number of people. And the reason for that is easy to explain. Mankind have been on a long journey to reach the point they are at today, and now, finally, you have made yourself ready to truly step into your true roles as citizens not just of this planet, but of all of Creation. And this journey has been one fraught with many perils and disturbances, and as such, information has been controlled in so many ways. We know that this is not news to any of you, for you all know well that here has been a lot of manipulation going on behind the scenes as it were, and this road that mankind have travelled down for such a long time, is not the road that mankind set out on from the beginning. But now, much has indeed been rectified, and as you all know, your own personal journey have been a vital part of this restructuring of your planet. For without the clearing and enligthening process you have taken upon you, nothing much would have changed at all on this, your home away from home as we like to call it, and mankind would have been forced to continue their journey torwards and over the precipice to certain destruction. But, as recent events have more than shown, enough of your brethren have chosen to do the same about-face as you, and for these last few months, the amount of light being poured into your world through your physical vessels has grown so much, it has washed away almost all traces of the manipulating denseness that used to surround you on all sides. We will not go into further details about this, we just bring it up in order to explain some of the reasons why you have in many ways been forced to go through an intermediary whenever you wanted to listen to the words coming from the light. But now, so many of those detrimental forces have been neutralized or removed, and so, your own abilities to connect will be greatly enhanced. You see, and open channel is an open channel, and earlier, it was much too tempting to those not so keen on enlarging the light quotient to use that open channel to further their ideas. In other words, many attempts at manipulation in the form of disinformation and willful embedding of low frequencies have been carried out, and some of them were indeed successful, while others where aborted. But still it was enough to keep us all busy to try to minimize any leakage of dark matter into the channels of the light. And believe us, it was at times a very hectic atmosphere on both sides of the veil. But now, the whole playing field has been changed in so many ways, and in addition, your own level of vibration has been raised so much higher by your willingness to tap into, and indeed be connected to, this web of light you have all become a part of. So now, the stakes are very, very different from what they were only a short time ago, and so, we urge you all to start to listen more closely to the signals you will be getting in the time ahead. For you too have your own Constant Companions, and they do come in all sorts of shapes and sizes. For remember, you are no longer a solitary being, travelling solo on this journey. In fact, you have never been a solitary traveller, but now, the time for you to start to connect even closer with your mates has come. Of course, some of them you have met already, maybe even in a physical form, but others are more unknown to you. In addition, your own group will have changed considerably throughout your journey, as they are all carefully chosen to match your vibrational field at all times. So yes, they are your constant companions, but they are also constantly changing, even if some of the components of your group will be constant. We gather that this will not be news to everyone, for some of you have for a long time had the ability to connect with entities on the other side, but for others, this will be new territory in all manners of speaking. And so, it will also feel a little bit daunting at first, for how do you know who it is you are ”talking” to? Is it not just yourself? Well, maybe it is, because you yourself are comprised of several levels of awareness, and the one you ”live and breathe” with every day is just a part of this whole. But now, as you all become ONE, you also become ONE with yourself, or maybe we should say ”yourselves”, and therein lies the first step towards acknowledging the messages you will be getting. For many times it is indeed YOU speaking to YOU, but it is a higher level of consciousness within you that is speaking to the human part of you. In addition, you will also start to get signals from other entities, so there is indeed so much to discover now. We know that this will seem to be not only daunting, but downright frightening to many of you. For what if the someone that comes knocking on your door will be of the not so benign kind? Well, let us first of all say that the chances for that are not very high, but in this, as in everything else, it is a question of awareness and intent. For you always check the credentials of anyone that wants to enter your home, do you not? In other words, you will use your discernment in this as you do in everything else, and if there is something that simply feels wrong, just say no and refuse to give them entry. It is as easy as that, as no one can ”enter” without your consent. And now, the light you all carry within is so strong, it will act as the best of shields in any circumstances. So just stay centered, and stay alert, and feel into whatever you feel approaching. And please know, even the most benign of energies can be a little bit overwhelming at first, but then, just ask for them to take it slow to let you get used to the energy. For this is first and furhermost a question of energy, and so, every new encounter will feel just that, new, in some sort of way, because you will come into contact with a form of energy that will feel a little bit alien to you, if we may use such a word. Again, just do what feels right for you, and do not try to force yourself to do anything. Just remember, the doors are not locked any more, and so you are also free to enter these halls of ”free speech”, but do so at a pace that feels comfortable to you. And pick your ”companions” to connect with as you feel guided to. Just know that you have litterally a whole host to choose from, and they are all eager to say hello in some way or another. And if you feel totally closed up, and everything seems silent, know that you are not alone either. You have just chosen to take your time and wait a little bit before you take this first tentative step into this, and that is OK too. Again, this is literally a one-on-one thing. So each and every one of you will have your own experience of this. Some of this energy will come to you in the form of words, through your fingers or through your ears. Others may have a heightened awareness of shapes and images, while others will start to sense unexpected smells in unexpected places, like the smell of roses when there are no roses present. Things like that, big and small, are all signs of someone trying to say ”hello” in a way, so do not think you have to follow in the footsteps of this channel in order to be able to communicate with your constant companions. Let us leave it at that for today, but we will indeed be back with more on the same subject later. Until then, we invite you all to start to listen well so as not to miss any ”hellos” coming you way.